Dynaudio DM 2/7 review | What Hi-Fi? You'd be forgiven for thinking Dynaudio has bigger fish to fry. 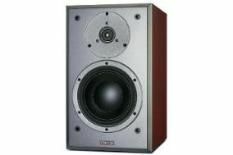 After all, its 'DM' range hasn't received the fanfare other products in the Danish specialist's portfolio have – and when a speaker is available, as these DM2/7s are, in only 'black ash' or 'rosewood' vinyl finishes, it's hardly likely to snare the casual browser, now is it? Ignore the uninspiring finishes and ho-hum appearance at your peril, though. The 17cm mid/bass driver, 28mm soft-dome tweeter and single pair of cable-binding posts may not set pulses racing, but as we all know it's not the data as written down that counts, it's the sound as heard. The Dynaudios are willing to make the best of whatever you throw at them. Fairport Convention's Farewell, Farewell isn't their immediate idea of a good time, but nonetheless the DM2/7s offer plenty of detail and expression to the gossamer song – they communicate deftly through the midrange and give the vocal all the pathos it requires. Refined in the upper frequencies and tonally even-handed, they're a poised and eloquent listen. Switch to Jungle Brothers' altogether more forthright Because I Got It Like That and the DM2/7s make even more sense. Summoning seemingly bottomless reserves of attack and drive, they slam through the song with the sort of dynamic potency that provokes shock and admiration in equal measure. Wind the volume to antisocial levels and the Dynaudios simply get louder, easily able to fill the biggest domestic listening spaces with sound without losing any control or focus. Integration of the frequency range is smooth, and the DM2/7s are particularly capable where the bottom end is concerned: bass is solidly punchy, tightly gripped and tonally articulate. And the Dynaudios have the speed and dexterity to make the most of this propulsive low-frequency presence. As true all-rounders, then, the Dynaudios are right on the money. Of course, they can be as tasteful and decorous as you may require, but when the time comes to don the disco pants they're gregarious, entertaining and entirely composed – even at considerable volume. Which can only be a good thing, even in rosewood vinyl.